Very much part of MGB history is the MGB Roadster Limited Edition and its closed coupe counterpart the MGB GT Limited Edition. These cars were built at Abingdon in 1979 and were in fact the last MGs to be built at the famous factory before its closure in October 1980. The MGB was originally launched in 1962 and can be described as the world's most successful sports car with over half a million examples being produced during its 18 year span of continuous production. It was by far the most popular British car to be sold in America since the war and it should be borne in mind that the MGB had two derivatives giving the sports car enthusiast an unrivalled choice of both open topped and closed GT motoring. The big advantage of the GT was that it had most of the attributes of the open top car but could accommodate a family if necessary. The basic shape of the MGB and GT remained virtually the same throughout its production life apart from the post 1975 cars sporting impact resistant black bumpers front and rear. There were some obvious mechanical and cosmetic changes made to the MGB along the way but there is no doubt that the MGB was ahead of its time when introduced in 1962 and had not dated by 1980 when production ceased and it was regarded by many as the best looking sports car of the sixties and seventies. EX 205, the Abingdon codename for the MGB was conceived as early as 1958 as the replacement for the highly successful MGA and this was before the last of the MGA model range, the MGA 1600 was put into production. There was a design exercise undertaken by the Italian coachbuilders, Frua codenamed EX 214 which had quite stunning lines and a very pleasing appearance apart from a rather aggressive front end. This prototype unfortunately never went into production and all efforts were concentrated on EX 205 which took four years to develop. It was anticipated that the MGB would only have a production life of seven years however the car survived three major corporate reorganisations through from British Motor Corporation that was absorbed into Leyland Motor Corporation which then became Leyland Cars and ultimately BL Cars in 1978. In 1975 the Triumph TR7 made its debut which in the long term was one factor which brought about the demise of the ageing MGB, however the MGB did have a very enthusiastic following in the home market but in 1979 with a very strong Pound Sterling against an ailing American Dollar the export market collapsed. Over 70% of Abingdon production went to the United States and with this very important market in such decline and no suitable replacement model in view, MGB production sadly ceased in 1980 and with it disappeared the famous Abingdon factory that had been the home of MG for 51 years. When launched the MGB was an all-new car in many respects and was distinguished by its unitary body and chassis structure. It was however not the first British sports car to be built this way, as this type of construction was first utilised on the Austin Healey Sprite, Sunbeam Alpine and MG Magnette as early as 1959. The monocoque construction allowed Abingdon engineers to increase the size of the passenger compartment and reduce the overall length of the car compared to its predecessor the MGA. This was achieved by moving the front limits of the compartment forward 6 inches and increasing the width of the cockpit by one inch, all this was made a lot easier without the hindrance of chassis cross members. As a result there was a lot more leg room and luggage space, all in a car that shared the same 262 cubic feet as the MGA. 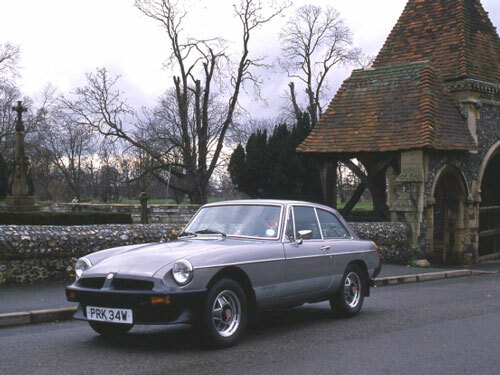 Although the MGB was technically brilliant and had eye catching features, it was a complicated car to produce and the tooling costs were very high. It required a long production run to recover these costs and as previously mentioned this was projected at seven years, it goes without saying that these costs were recouped over and over again. The GT version, designated EX 227, a very stylish 3 door hatchback and often referred to as 'the poor man's Aston Martin' did not appear until the Autumn of 1965 and went on sale at £998 which was £143 more than the Roadster. The GT gave considerably more accommodation than the Roadster with an occasional rear seat that would carry pre-teenage children and fold down to give a very usable load/luggage platform. With the additional weight of 251 lbs, the GT was not such a good performer as the Roadster acceleration wise, however its superior aerodynamics gave it a higher top speed of over 1OO mph. The third door/tailgate gave good access to the luggage area and made it overall a more practical sports car. The Italian design studio of Pininfarina were responsible for the GTs very pleasing lines and it was one of the first mass production cars to benefit from the relatively newly developed computer aided design techniques. Pressed Steel Fisher of Swindon who made up the body shells for final assembly at Abingdon received full sized film drawings direct from Italy which were then very rapidly converted to the production drawings, saving considerably on time and cost. Many of the Roadster components were common to the GT although it carried some that were unique mainly, doors, wings and obviously the roof. The GT carried on in volume production right up until 1980 and the Limited Edition GT featured was ostensibly produced to celebrate 50 years of production at Abingdon but sadly as already described the LE MGs were to mark the end of MG car production at Abingdon. The 'end of the line' MGBs were fitted with front spoilers and on the Roadster version with the choice of distinctive alloy wheels or wire spoke wheels. (212 cars were fitted with alloy wheels and 208 cars had wire wheels) The Roadster version was finished in bronze metallic with gold LE side stripes running the length of the car bodywork. The inside of the car was upholstered in orange and brown striped cloth trim and it was on sale for £6,445. The GT LE was finished in pewter metallic with silver side stripes and sported a silver grey interior, it carried a price tag of £6,937. A total of 1,000 Limited Edition MGBs were produced, 420 in Roadster form, 580 in GT form with the very last of each model going to the Heritage Trust Museum at Gaydon to add to their collection of historic vehicles. Valve operation: overhead operated by tappets, pushrods and rockers. No of bearings: 5 main. Power output: 97 bhp @ 5,500rpm. Maximum Torque: 105 Ib/ft @ 2,500 rpm. Transmission: 4 forward speed, 1 reverse all synchromesh. Clutch: Single dry plate, hydraulically operated. Suspension: front; coil and wishbone, rear; live axle with leaf springs. Dampers: Armstrong lever arm front & rear. Brakes: Hydraulic with servo assistance, front; 10.75" dia disc, rear; 10" dia drum. Acceleration: 0-60 mph; 14 secs.